What if you fell in love with a stranger...but that stranger had come from your past, a past you never knew existed until the moment your eyes met? When Tess Winters locks eyes with a stranger at an airport bookstore, it ignites a feeling of passion somewhere deep inside her that she can't explain. Although the encounter is innocent and brief, the intensity of it lingers, leaving her overwhelmed by a yearning for the mystery man now consuming her every thought. Struggling to break the powerful hold he has over her heart, Tess starts to experience strange but familiar dreams...dreams from the turn of the twentieth century of the charming Mr. Addison Taylor. As her dreams start to materialize into reality, and past and present begin to blur, Tess is forced to put the pieces of a forgotten time together, and soon discovers that love isn't the only thing that can find you after an eternity. Captivating, mysterious, and romantic, Life Lived Twice will leave you wondering whether love is so powerful it could last more than a lifetime. 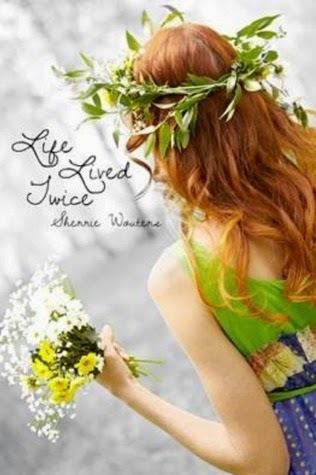 Life Lived Twice was such a great book! I felt like this novel was a genre-bender: the author describes it as a romantic fantasy with a supernatural edge, which it was, and the mix of genres made for an interesting and unique read. I was drawn into Tess' story right from the beginning. I liked her as a character and identified with her easily. Her first meeting with Logan was really intriguing; it was far from your typical "meet cute." Instead, it was a life-changing interaction, one that set the tone of mystery, romance, and chemistry for the entire book. I loved the way Wouters described Tess' emotions in that scene, and afterwards. Her inner dialogue was so easy to relate to, and the fact that Life Lived Twice is told in the first person, and I knew all of Tess' thoughts, intensified the love story even further. My two favorite genres are historical fiction and contemporary fiction, and Life Lived Twice encompassed both of those genres. What a treat! Life Lived Twice is a contemporary story with historical flashbacks. I love flashbacks, especially when they are told at the beginning of each chapter. They help keep the story fresh, interesting, and fast-paced. The main two themes of Life Lived Twice are the chemistry-filled love story and Tess trying to figure out the mystery of Logan. Right away, she feels like she knows him, and more than that, she feels like she knows him from another life. I liked that Tess and I were in the dark along together as to who Logan really was. The mystery was unique and the resolution of it was my favorite aspect of the book. I was completely surprised at how Wouters settled the mystery: it was a new concept for me and a really interesting one at that. I'm looking forward to diving deeper into this concept in the next book in this series. As Wouters was drawing the story to a close, I thought I knew how things would end. I was shocked at the ending: it literally left me breathless. As soon as I finished the story, I emailed Sherrie to ask/beg if there was going to be a follow-up book. I was so relieved and happy to hear that Life Lived Twice is the first in a series. I cannot wait to read book two! If you like contemporary fiction, historical fiction, magical realism, or even time travel themes, you will like Life Lived Twice. I highly recommend it!